Seattle Opera offered a challenge to five top chefs at local restaurants: create an appetizer and cocktail inspired by one of this season’s operas. We’re posting recipes for the creative, mouthwatering pairings they invented all week long. So blast your favorite opera recording on your sound system and get cooking! 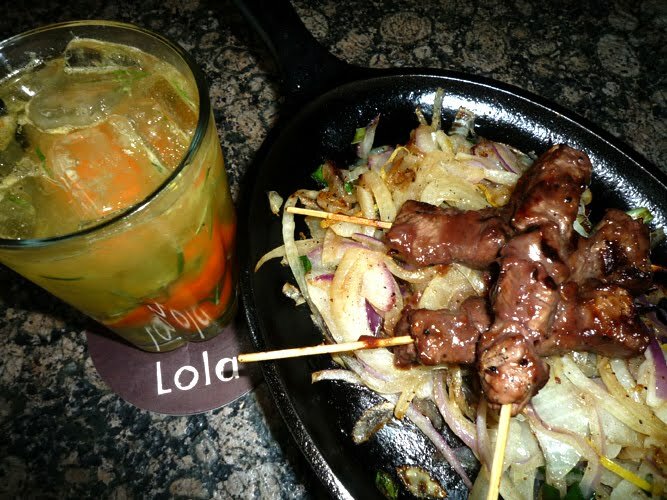 Lola has a “Greek spirit.” Modern Mediterranean and North African riffs on local ingredients like Anderson Valley Lamb, Penn Cove Shellfish and wild king salmon. Lola’s breakfast is the “best in town,” says Seattle Metropolitan Magazine, and reflects the homemade nature of the entire menu. Marinate the lamb several hours or a day ahead. You can also make the glaze a day or two ahead and store, covered, in the refrigerator. Allow the glaze to come to room temperature before using on the grill. Thread the lamb chunks on the bamboo skewers and place them in a non-reactive pan. Pour the Greek marinade over the lamb, turning the skewers to coat. Cover the pan with plastic wrap and allow to marinate in the refrigerator six hours or overnight. To make the glaze, melt the butter in a saucepan over medium-high heat and sauté the shallots a few minutes until lightly browned. Add the red wine, increase the heat to high, and boil until the wine is syrupy and reduced. You should have about 1/3 cup reduced wine. Whisk in the honey, season to taste with salt and pepper, and cook the glaze another minute. Then remove from the heat and allow the glaze to cool. Remove the lamb from the refrigerator and allow the meat to come to room temperature (about ½ hour). Remove the skewers from the marinade, shaking off excess marinade. When you are ready to grill the lamb, fire up your grill. Season the skewers on both sides with salt and pepper. Grill the lamb over direct heat, with the lid off, turning frequently with the tongs. Brush with the glaze as you turn them, using up all the glaze, until the lamb is done to your liking. Depending on the heat of your grill, the skewers will take about 7 to 8 minutes for medium rare. In a bowl, whisk together the garlic, oregano, zest, brandy, salt, and pepper. Gradually whisk in the olive oil. Muddle rosemary and orange in a glass. Add ouzo; shake with ice. Top with soda water and a splash of orange juice. I simply must try that Greek marinade that you shared. It will be very tasty for our meat skewer grills.